Recently, Barwon Health completed the final installation of low-dose digital radiography (DR or digital x-rays) across all of its Barwon Medical Imaging (BMI) sites. DR X-ray benefits include higher image quality, significantly less radiation dose (up to 50% dose reduction) and a faster and more efficient service for the community. High dependency areas at University Hospital such as ICU, Special Care Nursery, Emergency and the Operating Theatres all especially benefit from the availability of instant high quality, low dose x-ray images – supporting the immediate clinical management of patients. *All Medicare reimbursable imaging is bulk-billed at BMI, providing equitable access to state-of-the-art imaging across four locations in the region. 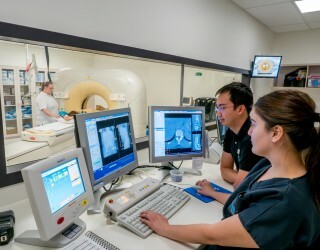 “With the recent installation of a new low-dose CT at BMI McKellar, Ballarat Road North Geelong, we now have the flexibility to offer same day CT to the community and encourage consumers to contact us to discuss their suitability for same day imaging. Walk-in x-ray services are available at all BMI locations”. BMI Operations Manager, Jeff Umbers. Choose BMI for your next imaging appointment.